← They’re Creepy And They’re Kooky…. 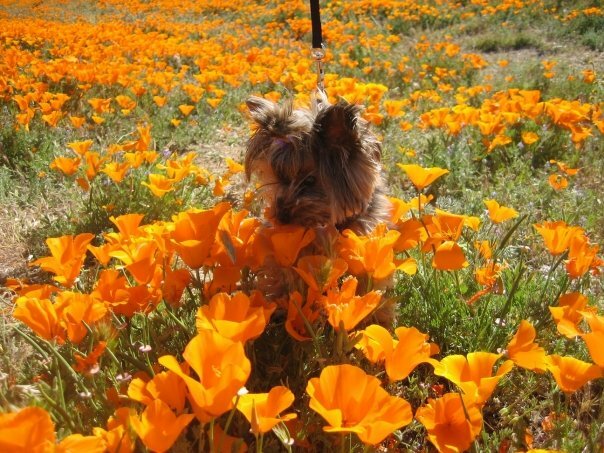 My little grandpuppy Jazz at the poppy preserve. This entry was posted in my life, wordless wednesday and tagged antelope valley poppy preserve, blogging, blogs, California, children, dogs, family, grandkids, grandmas, humor, kids, life, love, marriage, mom blogs, moms, mothers, my life, opinions, passions, passions and soapboxes, pets, photos, soapboxes, wordless wednesday, writing, yorkies. Bookmark the permalink. 5 Responses to Wordless Wednesday: Spring Forward…. Oh. My. Gosh. I’m in love. Can I put this picture on my blog? ?